The U.S. Coast Guard’s “Relief Fleet” assembled to meet the emergency, 1927. It is often noted but rarely enters into meaningful consideration, especially at the political top, how massive spending bills and expansive legislative efforts — though filled with the best of intentions to help America’s “forgotten man,” as Amity Shlaes has termed it — actually lose the “little guy” in the shuffle of competing interests. Begun as a noble effort to rescue the common man from “Big” this or that, the end result usually leaves him or her paying the bill for everyone else. This is no less true with farm legislation or disaster relief than with any other object for government expenditures. The year 1928 presented such a fight on both fronts against a President firmly committed to budget discipline and fiscal sanity. The Farm Bloc, repulsed by President Coolidge’s veto the previous year, were moving to present an amended bill retaining the heart of earlier incarnations, an equalization fee that would summon the government into agricultural market participation to a degree the country had not known before. The Mississippi River basin had flooded and the Midwest and South was immersed in a very real distress and loss. The rains had then proceeded to move north and deluge Vermont. Coolidge, criticized at the time for callous absence from the inundated areas, remained consistently distant on principle, even when the suffering came to his native state. 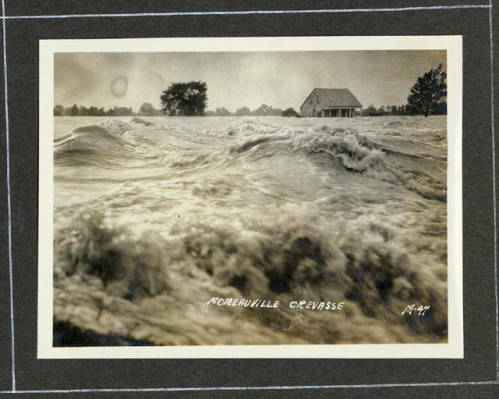 Flood damage in McGehee, Arkansas, May 1927. 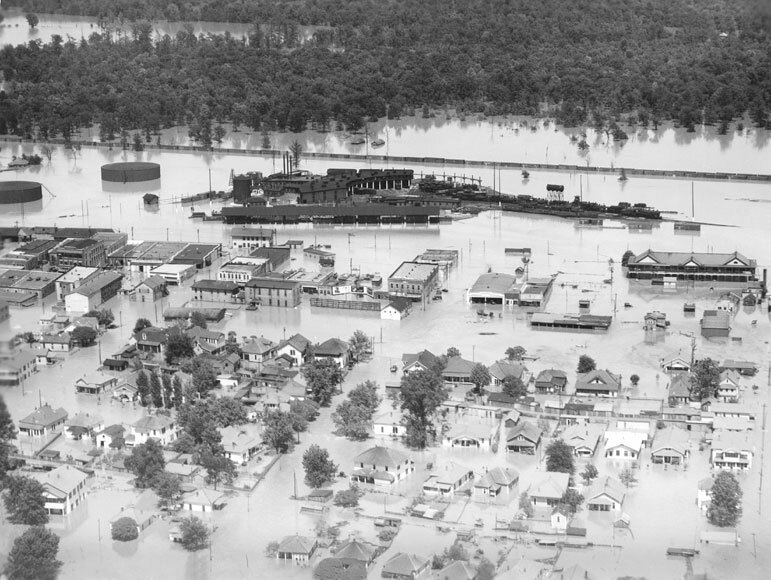 See http://kaiology.wordpress.com/2011/08/13/coolidge-and-the-1927-mississippi-flood/. As the two most expensive domestic spending bills developed in Congress, it would be Coolidge who would stand unmoved as the best advocate of the “forgotten man.” Funding and returns on that funding should remain closest to those concerned, at the most individual and local level. As weeks turned to months, however, the cost of the flood control bill continued to grow, taking in an ever-widening sphere of participants. From what had begun as a $200 million endeavor the Senate, through the sponsorship of Senator Jones, debate had raised the total to over $1.5 billion, an incredibly unrealistic figure, proposing untold burdens on the people who work and pay across the country. Through determined effort, meeting repeatedly with the legislators of both the House and Senate versions, Coolidge ensured the final cost had been hammered down to $325 million, a reduction of $1.175 billion from future taxes proposed to pay for such astronomical funds. President Coolidge would sign the Flood Control Act on May 15, 1928, only after an intense overhaul of its suggested price tag had been chopped and most of its contents presented an improved piece of legislation from where it had started out earlier in the year. However, to Coolidge’s disapproval, it retained a measure that set the precedent for the Government — drawn from the several States – to pay damages to victims of natural disasters, something it had never done for lack of justified liability. In years to come, it would become the basis for even more extensive internal improvement projects directed from Washington. Flood waters in Moreauville, Louisiana. Courtesy of the LSU Special Collections Archive. For now, however, Coolidge had waged this critical fight not for himself — he had made it plain he was not seeking office again — he was thinking of all those men, women and children destitute, their material goods ruined and their circumstances forever altered. If these folks were to be benefited by whatever would be agreed upon, the final result could not provide for the contractors, the manufacturers, the municipal and county authorities, or large developers first and leave those directly impacted out in the cold. Meanwhile, the Congress had been piecing together a new McNary-Haugen farmer relief bill that would attempt to integrate some of Coolidge’s suggestions for improvement while retaining the essence of its most objectionable ingredients. Sent to the President’s desk in the midst of the fight over flood relief, Coolidge would veto the agriculture bill eight days after signing the Flood Control Act. On the surface this appears to be a contradiction. Why not veto both? The merits of these measures, to President Coolidge, rose or fell with the importance placed upon actually delivering the most good to those directly concerned. While the efforts Coolidge secured drastically improved Flood Control, he did not possess similar influence to make headway among the Farm Bloc regarding their approach to agricultural relief. With farm relief, Coolidge kept a confidence that better legislation could be reached while he did not hold the similar optimism for rescuing flood control from an already barely salvageable position. Time afforded by vetoing flood control provisions would only reopen the floodgates, so to speak, for a new explosion of petitioners. A veto of McNary-Haugen, on the other hand, stood a better chance of improving with time as some of the amendments inserted in the second version of the bill indicated. Coolidge held out for a better bill without the “equalization fee” and complex price-setting scheme. Attaching his veto to the second McNary-Haugen, Coolidge explained how central to his six objections was a concern that regular farming families, the supposed focus of the bill, were being forgotten in the cluster of interests for which new provisions were being promised. Coolidge wrote,“[I}f the measure is enacted one would be led to wonder how long it would be before producers in other lines would clamor for similar ‘equalizing’ subsidies from the public coffers. The lobbies of Congress would be filled with emissaries from every momentarily distressed industry demanding similar relief of a burdensome surplus at the expense of the Treasury. Once we plunged into the futile sophistries of such a system of wholesale commercial doles for special groups of middlemen and distributors at the expense of farmers and other producers, it is difficult to see what the end might be. 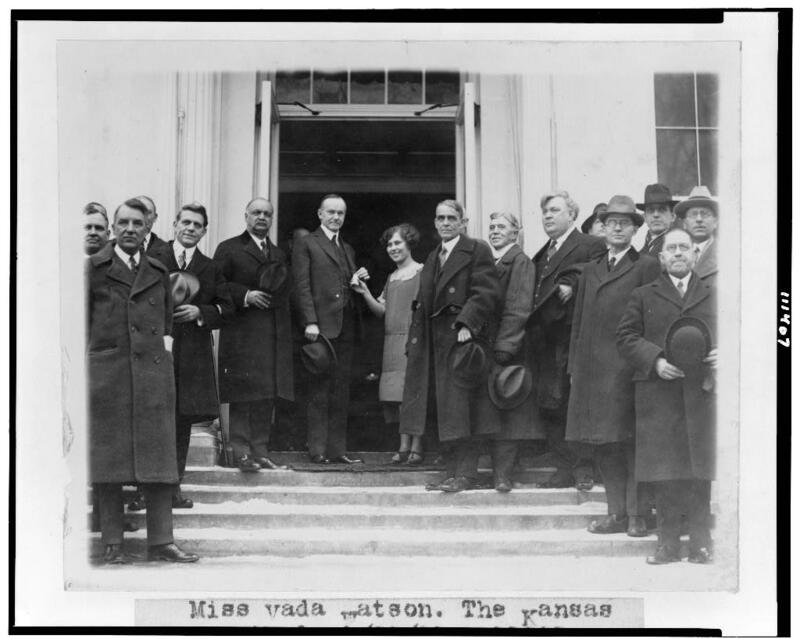 President Coolidge with Miss Vada Watson, Kansas wheat girl, 1925. Courtesy of the Library of Congress.